If—like the rest of America—you’re suffering from a bad case of ’90s nostalgia, I’m here to help you get the look of your favorite ’90s college football coach. Though college football isn’t regarded as particularly fashionable, the idiosyncratic look of the ’90s college football coach has been standard on couture runways for at least two seasons: Khaki pants, oversized glasses, windbreakers, ugly sneakers, and dad hats abound thanks to designers like Balenciaga and Alexander Wang (who sent a football jersey and athletic socks down his Fall 2018 runway). Bella Hadid is one pair of khakis away from dressing just like Bobby Bowden. Which is to say, dressing like a practical dad is stylish—and, of course, wildly expensive. So here’s a guide to help you navigate designer looks inspired by some notable ’90s college football coaches. 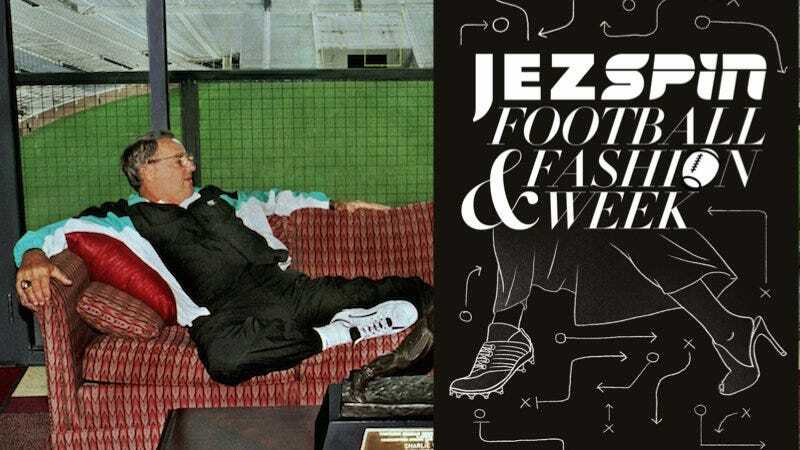 Now you can love your team while wearing thousands of dollars worth of couture inspired by some famous football guys. Bobby Bowden’s look in the ’90s—and his entire coaching career—screamed: “Dad who insists that Dockers are affordable and last a long time.” Sure, you could easily recreate Bowden’s look by buying some pleated Dockers at Sears (which I’m assuming still sells Dockers) and stocking up on Florida State hats and windbreakers from that sad FSU store in the Governor’s Square Mall, but the point here is to be needless fashionable and spend a lot of money. The ’90s was the era of the pleated khaki pant. It was a staple for Bowden and, luckily for you, it’s back in style. Start with these front-pleat khakis from Etro, currently on sale (half off!) for $320. If you’re really committed, or discounts aren’t your thing, then try these pleated front “carrot leg” khakis from Valentino for $695. Next, you’ll need a basic polo for layering or to wear alone on hot Tallahassee days. This Thom Browne polo with sporty stripes, retailing at Barney’s for a reasonable $440, is perfect. Since Bowden was a fan of the monotone look, pair your pleated khakis with Balenciaga’s oversized beige windbreaker for a cool $1,790. If you’re looking for a bit more FSU spirit, or really want to sweat to death in Doak, layer with this Givenchy velvet colorblocked polo (only $780) and skip the Balenciaga windbreak. For the unwashed mass of humanity known as Florida fans, Steve Spurrier’s ’90s look is pretty easy. Like Bowden, your building block is a pleat-front khaki pant (it’s a truth universally acknowledged that football coaches love a pleat). Bowden’s will work in a pinch, but Spurrier’s khakis were slightly more fitted and always a bit more disheveled, as though his perpetual emotional stew of anxious disappointment had somehow spilled on to his entire wardrobe. Try these Fear of God drawstring khakis for $795 to get that “ready to yell at Danny Wuerffel” look. Pair them with this royal blue Moncler polo shirt for $240. Make sure you buy it at least one size too big. Spurrier too was a man of accessories. He preferred a sweater vest for chilly days—a quintessential dad piece. Your options this season are pretty limited, but N. Peal has this cashmere number for $270 (cashmere is, of course, the perfect material to be drenched by a cooler of Gatorade). Spurrier was also a pioneer of the practical sneaker and, once again, Balenciaga fits the bill with these mesh and leather white sneakers for $895. Of course, the look would be incomplete without Spurrier’s iconic visor; the accessory that was more often than not the material manifestation of his sideline rage. Instead of the classic cotton visor, try Dior’s version—which is inexplicably being sold as eyewear—for $319. If you think it looks silly, be comforted by this picture of ASAP Rocky wearing one in May. Now you’re ready to yell at a teenager and shake your head with the melodramatic flair of a drama major. Bonus: This look works also for Bob Stoops, but tone down the theatrics. The shoes and visor also works for either of the Hadid sisters. Like his counterparts, Lou Holtz was a man of khaki. There are already a number of khakis to choose from, but if you aren’t feeling any of those, then try these Tom Ford cargos for $890. Add to that either the Thom Browne white polo or, for a more formal feel, a Thom Browne button-down for $450 under this Balenciaga nylon jacket for $1,650 with some Notre Dame blue and a hint of green. Finish it off with Yeezy 500 Blush sneakers for a reasonable (I guess) $265 to really get that “I’m sporty but have to walk the sideline like a runway” look. Your look wouldn’t be complete without pronounced glasses. Holtz’s style was—and is—defined for his penchant for dramatic eyewear. Since nearly every hypebeast and half of the current Insta models appreciate statement specs, there are a lot of Holtz-inspired options available. These Grey Ant frames are large and a bit more delicate than Holtz’s thick metallic frames but get the point across. They retail for $390 and, according to Nordstrom’s website, were “handcrafted in Italy.” These $400 gold Gucci frames are almost perfect. Who knew Holtz was such a fashion icon? Put it all together and you’ll look like a man who loves Rudy and still thinks “Catholics vs. Convicts” is the height of wit. There’s a strong possibility , however,that you’ll look less Holtz and more like Justin Bieber. Who can say? Finally, a man who doesn’t wear khakis. Stallings’s look lived in the space between Bear Bryant cosplay and winner of a major golf tournament. Though he loved that hideous crimson blazer, let’s instead focus on his penchant for plaid and understated houndstooth blazers. Tom Ford’s cashmere blazer for $3,950 is almost perfect, though probably a little more tailored than anything Stallings would wear. If, like my dad, that price tag made you gasp, shake your head and mutter something about Sears, try Boglioli’s three-button sportscoat for $1,195, which has swanky gold buttons. If you want to go full Roll Tide-Bear Bryant-homage, try Balenciaga’s wool houndstooth coat for $6,200. Its tailoring looks insane! Stallings loved the short-sleeve button-up, usually in white. Alexander McQueen’s button-up retails for $360, but might look a little uncomfortable with a tie. There’s also Maison Margiela’s version, now on sale for $228, that looks a bit more tie-friendly. Speaking of ties, I can’t imagine that Stallings ever spent more than $30 on one, so keep it classic with a solid tie from Brooks Brothers, all of which retail for around $80. Pair blazer, shirt, and tie with Prada’s $540 gabardine trousers in a shade that winks at Alabama’s crimson. Borrow a tie clip from your grandfather (fashion can’t help you here) and you’ll look like a man ready to face down a three-year probation and forfeit a bunch of wins. If any of the looks above are just too formal or fitted for you, then the slightly wrinkled, oversized tracksuit is your answer. Miami’s Dennis Erickson loved the tracksuit, and Bowden wore them on occasion, as did Stallings. Alexander Wang’s separates for Adidas have that laissez-faire rumpled look incorporated into the design—Barney’s is calling them “crinkled tech-fabric.” Wang’s track pants run for $220, and the matching jacket costs $250. Any of Balenciaga’s terrible shoes will work to complete this look, but these $895 sneakers in neon yellow are particularly upsetting. If separates feel like too much work, then try Prada’s nylon jumpsuit for $1,790, which will give you the fabric and feel with better tailoring. Between all of these looks, you’ll look great no matter which NCAA rules you chose to violate.